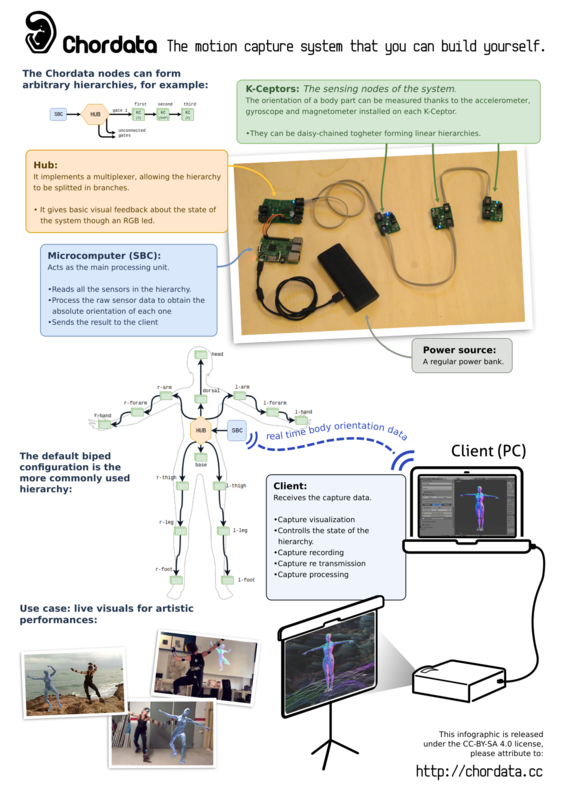 An open hardware-software framework based on inertial sensors that anyone can use to build a human motion capture system. All tech related to motion capture from eye, hand or full-body capture. This project was created on 09/29/2017 and last updated 2 months ago. A couple of years ago I wanted to make a digital performance with a dancer on stage, and wanted to use a mocap suit to get his movements. There was none available at an affordable price, so I started the development of this one. In the meantime, several cheaper options came out, but those remain out of the capability of most users and, more importantly, they work under proprietary licenses. You can’t modify the way they work, or use part of them in another software project. As an alternative, this is a motion capture system that can be easily assembled by anyone in order for them to start capturing as soon as they are able to build it. Additionally, it is an open hardware-software framework that can be freely tweaked, enhanced, or used as part of another project. Chordata is a motion capture system that you can build yourself. Our goal is taking the world of motion capture to the universe of DIY technologies with an Open Hardware approach. For a quick introduction you can watch the video below, or visit our website. Detailed technical information, building instructions and user manual are available at our wiki. Or perhaps you prefer to dive directly into the code and KICAD sources at our repositories at gitlab. The origin of Chordata was a basic need. Bruno, our tech lead, wanted a way to register dance moves for a performance piece, but none of the tools available matched his needs (nor his budget). A lot has happened since then: now the system is publicly available (as an ALPHA release for now), and lots of documentation can be found on the sites described above. Just for the record we leave the original description of the project below, as it was written when the main parts of the system were under development. Motion capture is about getting the orientation of every body limb or part at real time as accurate as possible. A simple MEMS IMU device*, and freely available sensor fusion algorithms are enough to get a decent result. The problem starts when you want to get the data of several devices. Most of this devices came with an i2c interface, but their address is fixed in the hardware. So one of the building blocks of Chordata is the sensing unit capable of coexisting with several “siblings” on the same bus: the “K-Ceptor” It consists of a LSM9DS1 IMU, and a LTC4316 i2c address translator. While developing and prototyping we hand-soldered lots of these boards in house, so having the minimum possible number of SMD components per board made that process a little easier. Getting the data of a lot of sensors on real time, processing it, and send it in an easy-to-read format to some client is not a simple job, so I’m developing a software from scratch to deal with it. Building a digital model of the physical hierarchy of sensors. Initializing the i2c communication on the Hub, and running the configuration routine on each of the sensors. Performing a reading on each of the sensors at the specified refresh rate. Correcting each sensor reading with the deviation obtained on a previous calibration process. Performing a sensor fusion on the corrected sensor reading, obtaining absolute orientation information in form of a quaternion. It’s not an expensive component. Programming and debugging is enormously simplified. Some of them, like the rPi3, came out of the box with all the communication peripherals needed to perform a confortable capture, with the remarkable example of the Wifi adapter. Dear hackers, we’re happy to inform you that after several weeks working on it, Chordata has its documentation available! Those of you who were eager to build your own motioncapture system, now have a dedicated learning material. We choose to implement it as a wiki, since that type of content structure perfectly suits the Chordata philosophy: sharing and constructing knowledge together. So we’ll be glad to hear your suggestions, or receive your contributions to make a bigger and more useful knowledge base. A summary of the User Manual can be found on the instructions section of this project&apos;s page. And we have also uploaded here a pdf with a detailed description of how the Chordata system is implemented, it contains: parts specifications, functional diagrams, schematics, protocol descriptions, power considerations, and more. (We will be uploading that content to the wiki on the following days). If you have no idea what the Chordata system is about you can just take a look to our new basic infographics. These days we are working hard to prepare the documentation. We are expecting to publish a big part of it by the end of October, so stay tuned for detailed explanations on how the system works and how it can be built! Chordata was born several years ago with the idea of using it to create art from human motion. It took a long time of technical development, but now that the system is up and running we&apos;re having so much fun collaborating with several artists to test the possibilities of the system on different disciplines. Having the possibility of test it on real use cases and get feedback from real artists is invaluable to keep improving the usability and stability of the system! A very special thank to Sergio and Valentina from Orange8, who provided us a really cool location in an old church for experimenting in Gaeta, Italy. One particularity on the development of this project is the amount of units needed on every prototype. Everytime we what to test something new we have to build around 15 sensing units (K-Ceptors). Anyone who has tried hand soldering SMD components know how easy is to get it wrong. So we are proud to introduce our new assistant in the lab: The testbed! It allows us to troubleshoot the boards as soon as we take them out of the oven, saving us incredible amounts of time (and tears). We would really like to thank Sparkfun Electronics for the inspiration they gave us by publishing their production process, and showing (amoung many other things) how they test their widgets with a pogobed. Since we’ve focused our communication efforts in an electronic-oriented website, we’ve been omitting an important part of our project: the 3D model and rigging we use to visualize the captures. At the beginning we used a slightly modified version of a female model that we downloaded from blendswap. The model was originally created by AlexanderLee and we really liked its shape, but it was not optimized for real time visualization, and the rigging didn’t match our requirements. This meant that Bruno (Chordata’s founder and a 3D animator himself) had to apply some changes on the fly and in a rush. Then, as it usually happens, we kept recycling the model that resulted from those quick changes. That kept being a limitation until one day François showed up offering his 3D modeling and rigging skills. He did a great job adapting the model to be used in real-time motion capture. -Retopology: This is the process of rearranging the flow of polygons on a mesh to better respond to certain deformations. Check out the comparison images below: do you note how smooth the formation in the front area of the shoulder is with the new topology? Thanks François for this great contribution! Even if the captures can be applied to any arbitrary model and rigging, having a good default one for visualization is a great improvement that will allow us to improve Chordata and test it in better conditions. From the work done during our motion capture hackathon last month, our new collaborator Antonio Ianiero (iant ) made some interesting modifications to the networking infrastructure. Before these, an external router (or smartphone as a hotspot) had to be used to create a small ad-hoc network, to which the microcomputer and the client PC had to connect. Antonio saw this solution as impractical and inefficient. Instead he configured the microcomputer to act as an access point: on powering it exposes an SSID to which any WIFI capable device can connect. In this way, not only do we eliminate unnecessary intermediate in the network, but also the portability of the system is considerably improved. For example, to capture in an external environment you only need to carry a laptop with charged batteries. Thanks to Antonio for such a huge boost! Dear Chordata followers and collaborators, we have some awesome news to share with all of you: the day has come when we finally release the core of Chordata’s motion capture system. In this initial release, we’ll make our code repositories public so that anyone with a little bit of electronic and/or coding experience can go ahead an dive into the intricacies of our project. Those brave enough will also be able to download set up their own motion capture system by downloading the sources, and building the system from scratch. There’s at the moment no official documentation, but we’ll be happy to assist those adventure seekers that wish to take their chance at building Chordata with the materials at hand. Be aware that this is an alpha release: we’ll keep on testing and improving the system in the next months (and we’ll obviously let you know about all of the improvements to come). One of the things that drives us when displaying the code is finally being able to expand our scope of collaborators, so feel free to write us through Hackaday discussion or with the form that you can find in our website. That’s all fine and dandy, but there will be more to come. We’re preparing Chordata’s documentation so that anyone can access the core functionalities without the need of any sort of expertise. We’re also preparing a Tindie store in which you’ll be able to purchase our pre-built kits: this will enable people without knowledge of electronics to build and use Chordata so that they can apply its functionalities in their personal projects. What this means is that we’re just beginning, as Chordata’s purpose is reaching both those who already work with electronics and the general public so that the worlds of visual art, game design, animation, movement computing, gait analysis, physical therapies, among others, can also benefit from the possibility of capturing motion in a more accessible and open system. We have no official release date, but we expect all of these additional releases to be done during the next semester. Don’t hesitate to write us with all of your doubts (or simply to express your appreciation, as that’s what drives us further). We’re eager to see your reaction! Today we&apos;ve launched a new video explaining all the features of Chordata, the Open Source motion capture system that you can build yourself. Make sure to check it out in our YouTube page and give it a like. We’ve also launched our new website, which features links to all of our social networks. With all of these tools, you’ll now be able to follow the evolution of Chordata without missing a single step of the process. All this couldn’t been possible without the work of our new team members, Juancho and Flavia, who are helping out with communications and social media. If you want to give a little help to the project, is as easy as giving it a like here on hackaday, which will help us to stand out on the Human-Computer Interface round, in the current edition of the Hackaday price. The motion capture hackathon took place last week . It was great to see the Chordata system used on so many different projects! Arianna: a great prototype for an easy low cost DIY sensor attachment suit. Antonio: networking improvements. SBC as an access point. Kine: thanks for soldering all those sensors! Massimo and Sara: processing SDK foundations. This gives the user a simplified interface to work with the mocap information. Stefano: Unity 3D integration. Making visuals to go with the music. We gathered lots of information about bugs, and possible interface improvements! Not to forget, of course... The winner of the hackathon by unanimous decision: Valerio and his dinosaur capturing tail prosthesis!! Many thanks to all the partecipants. We had a great time! We have released all the working files and sources. You can get them by visiting our online repository, or in this project page. Be aware that this is an alpha release: we’ll keep on testing and improving the system in the next months (and we’ll obviously let you know about all of the improvements to come). One of the things that drives us when displaying the code is finally being able to expand our scope of collaborators, so feel free to write us through Hackaday discussion or with the form that you can find at our website. In this project page you will be able to find a quick description of the main steps needed to build and use your own motion capture gear, if you want to get the full picture please visit our online documentation. We’re also preparing a Tindie store in which you’ll be able to purchase our pre-built kits: this will enable people without knowledge of electronics to build and use Chordata so that they can apply its functionalities in their personal projects. The Chordata specific hardware is compound of three different parts. Buy pre assembled kits at our Tindie store. Each one comes with the board and some pre-soldered components (all the difficult ones), and includes a few additional components to be soldered by you. Start by downloading the sources at our website or gitlab repository and send them to your favorite PCB manufacturer. Buy all the components, the BOM can be found at the downloads section of this project page. Solder everything together. The current version of the Chordata hardware uses as many THT components as possible, but there are some tiny SMD ones to be soldered as well. See the Chordata parts chapter on our documentation for more details. Apart from our hardware you will need a regular Microcomputer like the Raspberry pi (microcomputer is just a colloquial name, technically is called SBC). The software part of the Chordata system is composed of several programs, and most of them should be running on the SBC. The easier way to get them all, and configure them correctly, is to download the custom Linux (Raspbian based) image that will soon be available at our webpage. The process of flashing is really simple using the dedicated tool Etcher, available for Windows, Mac and Linux. Start by downloading from their webpage, and installing it. Insert the SD card on your computer’s card reader. On Etcher select the downloaded file, select your SD card as a destination disk and hit Flash! See the Microcomputer chapter on our documentation for more details. Hy , I&apos;m working in an animation studio , and would like to know if it was possible to test this great tools to help animators to improve theyre hard work , and bring a touch of realty into model&apos;s movements . Hey Bruno Aswome project :). Its possible to become a beta tester? We are currently evaluating the last few candidates of this betatesting batch. Please write us with a brief description of your background and how do you plan to use the system and you might still have a chance. Or, if you don&apos;t make it on this round we will probably open a second one on the following months. Currently we&apos;re preparing an initial prototype offer that we expect to release by January 2019 as part of our first Beta testing program. Keep in mind that there will only be a limited amount of suits produced during this period. Once the Beta period is over we will start offering the first production release which price and release date is still to be determined. If you are interested on participating on the beta testing program please get in touch with us. I think the quality of the video makes it harder to motion capture maybe downgrading video or low ISO or black and white with lights can help motion capture at least in a 2d projected sense. Have you seen that wiimote hack by john on youtube. He flipped the wiimote IR camera around and put IR leds in the eyeglasses I want to use this method but without the wiimote. With this head tracking you can animate the 4d space inside of a TV like when you move you head and look out a small with or make a circle or square with your hands and look through it while moving your head its somekind of parallax effect. This is amazing, are you considering adding position capture to your system? When working with inertial-based capture, position tracking is kind of an indirect feature, it depends on having a good inner-pose tracking. At the moment we are working on delivering a solid inner-pose, and a smooth user experience. We expect to achieve these goals with our first release. After that, position tracking is one of the main objectives. So these are gyroscopes? Like Accelerometers in phone? Pretty exciting project... def interested! Honored by your interest Sophi, I saw you doing pretty cool stuff around here! Awesome, guys. This is something I&apos;ve been thinking about for a while now, so very please to see someone actually doing it. I&apos;m keen on mixing the mocap with VR. I look forward to you release the instructions in August. Best of luck. Thanks! looking forward to see what you can do with it! Amazing project! I am eager to build mine alongside the instruction when it will be release.I am an absolute zero at these electronic things but I would love to build a mocap suit for 3D animation. As a 3D artist, if I can help you in some ways, please reach out to me. An autonomous vehicle that utilizes machine vision as well as data from sensors, to follow street lanes, park and overtake obstacles. Sitting for long periods has become more common in today’s life causing serious health issues. Sit.Up! You are about to report the project "Motion Capture system that you can build yourself", please tell us the reason.